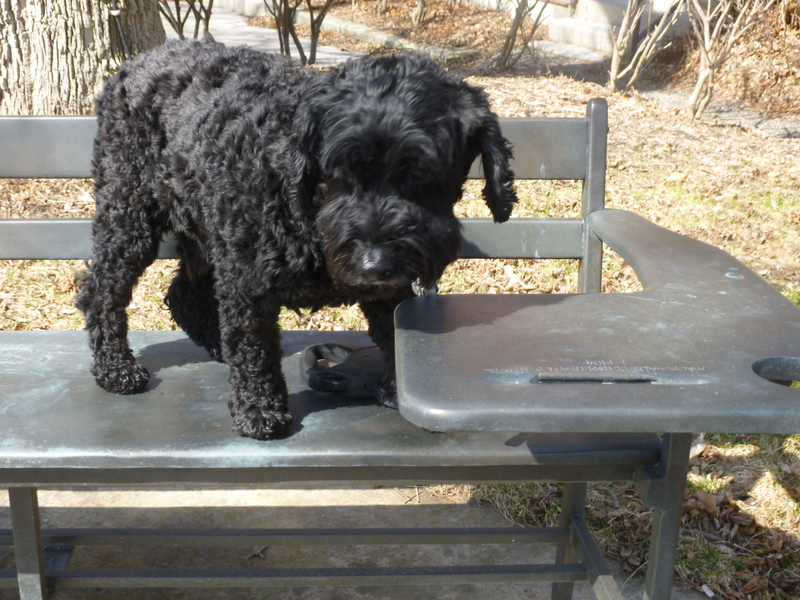 It was a great idea to take my schnoodle Victor to the outdoor art park … until it wasn’t. We’re hanging out at the Guelph Art Gallery (formerly the McDonald Stewart Art Centre) sculpture park on the University of Guelph campus in Guelph, Ontario. There’s no going into the gallery today, though, and not just because of the dog. The gallery was closed until September 17, 2015 for renovations that altered the front entrance – and name – of this art centre, which originally opened in 1980 (six years before I attended U of G, affectionately known as Moo U.). 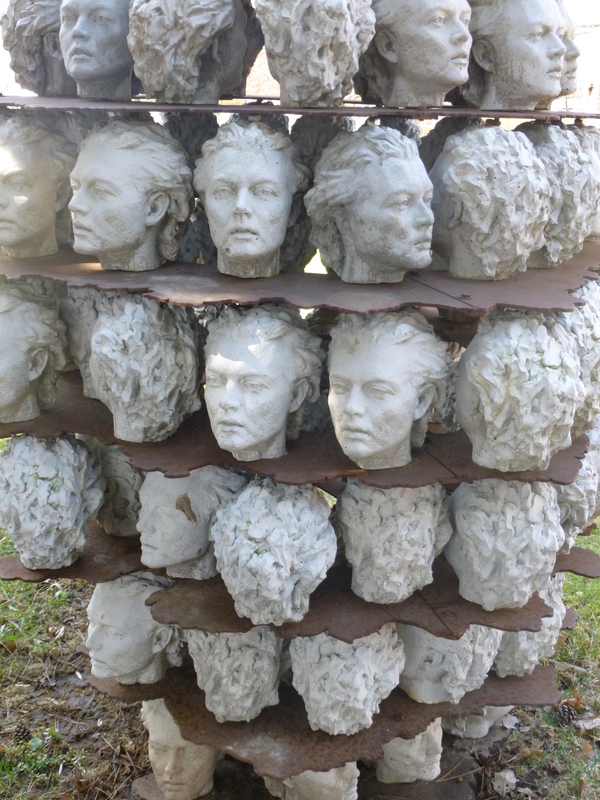 The Donald Forester sculpture park (and city) has evolved a lot since its inception when the inverted sculpture “Mask” by Evan Penny landed on the grounds face down – or face up depending on your perspective. It’s hard not to notice this piece at the corner of Gordon Street and College Avenue; it’s the anchor to what’s evolved into a 40-piece outdoor collection of realistic and abstract sculptures, the largest of its kind in Canada (by number). This park holds a nostalgic place in my heart. I spent the better part of six and a half years at my alma mater (two degrees folks, I’m not that slow) and the sculpture garden was a welcome sanctuary from campus energy. Here I am, back in town decades later, and what better way to bond with my little Vic than let him explore some of my favourite art – Cynthia Short’s “Lightmare” – and some I haven’t seen before – Verne Harrison’s ‘Dual School Bench?’ Anything outdoors (on my authority) is dog-friendly, especially if there’s grass involved. 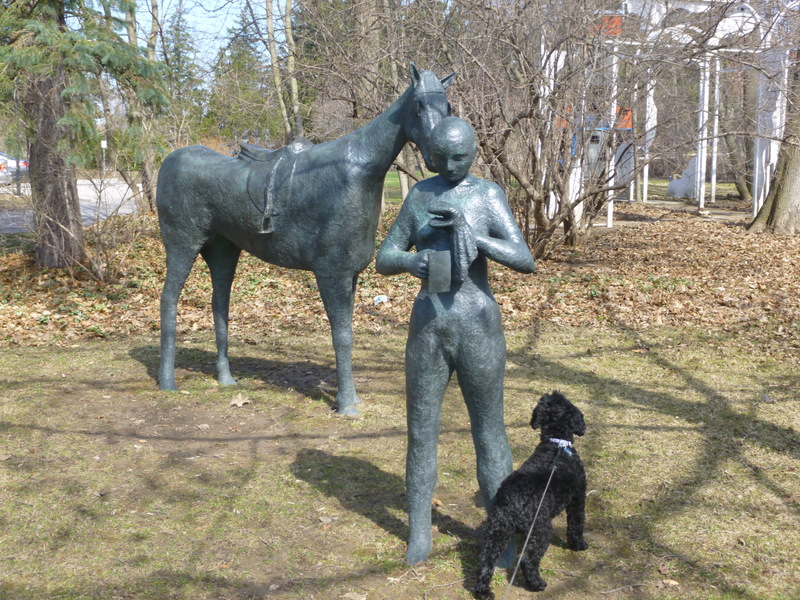 Art and dogs – awesome combination, right? I glance frantically about hoping no one noticed our indiscretions. Fortunately, on this quiet spring day we had the place to ourselves, and passing traffic. Hopefully, it’ll rain tonight and erase the evidence. 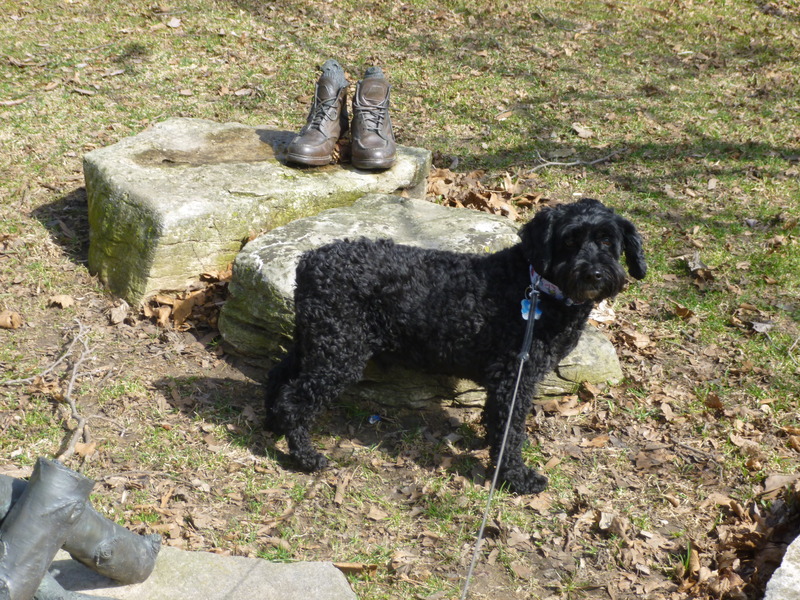 Next, we’re headed quickly to the Hanlon dog park in Guelph – all dog, no art … more on that later. In the meantime,read about our adventures in Peterborough here. Love dogs and art? Checkout this cool but heart-warming piece by Dean Russo here. ← Contest: Does You Dog Need a Jacket? You Bet. Win one!.